Six months ago, Ghost was revealed the public for the first time on Kickstarter. It raised more than $100,000 in the first 48 hours of funding, and went on to triple that figure within its 29 day funding period, the Ghost prototype received more attention than ever before as people finally saw the platform in action. Ghost is a platform dedicated to one thing: Publishing. It’s beautifully designed, completely customisable and completely Open Source. 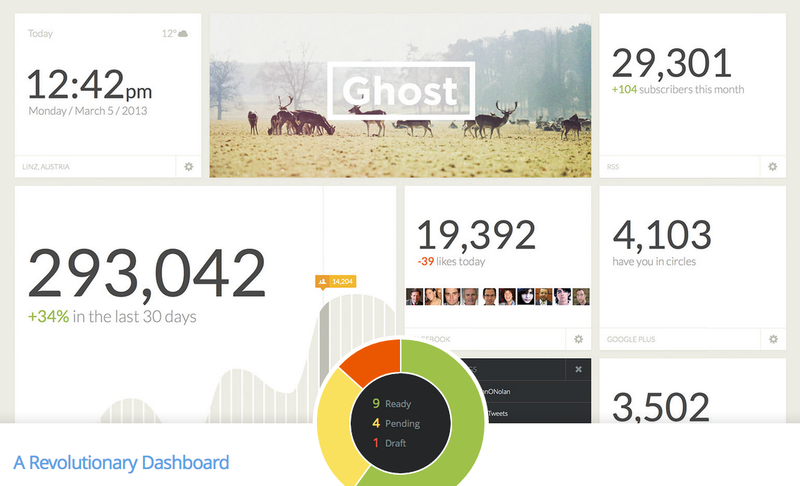 Ghost allows you to write and publish your own blog, giving you the tools to make it easy and even fun to do. It’s simple, elegant, and designed so that you can spend less time messing with making your blog work – and more time blogging. Ghost is free software released under the MIT License, which pretty much means you can do anything you want with it. The MIT License is one of the most free and open licenses in the world, and does not restrict how you use the software which it’s applied to. We believe open source software should be free. As in free. I’m relly looking forward to working with Ghost, but when will it launch? Oh, I missed that you need to create a user to download… Seems a bit weird for an open source system, but ok. They seem to be, they have a button that’s not clickable at the moment that reads “Start a new Ghost blog”. But they could still have had the download button outside of the login screen. I tried and install this in my desktop, and it is really simple and sleek blog and cms. no need for sql or database because “Markdown” was the main editor. However, im trying to look how to make the admin looks like the main image cover?